The idea behind HTML 5's heading algorithm is great: it allows to create valid and highly accessible heading outlines that can be much easier to implement than traditional ones. Sadly, it was never really picked up by any browser or screen reader, and the HTML 5.2 draft advises against using it any further. No single relevant assistive software supports the HTML 5 outline algorithm (and as such it is advised against in the current HTML 5.2 draft). So you cannot use it for your websites. If it already happened though, there are ways to fix it using ARIA. The HTML 5's heading outline algorithm allows to create and maintain valid heading outlines very easily by using the HTML 5 structural elements like <main>, <article> and <aside>. 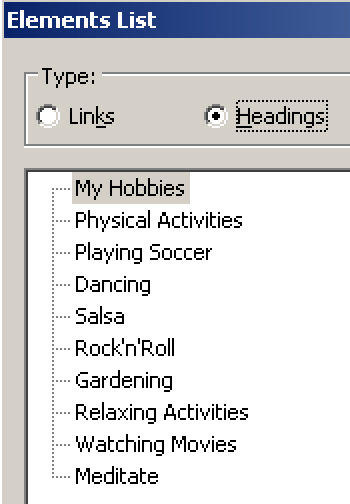 In traditional HTML, you have to choose the correct heading level rigorously depending on the current context. 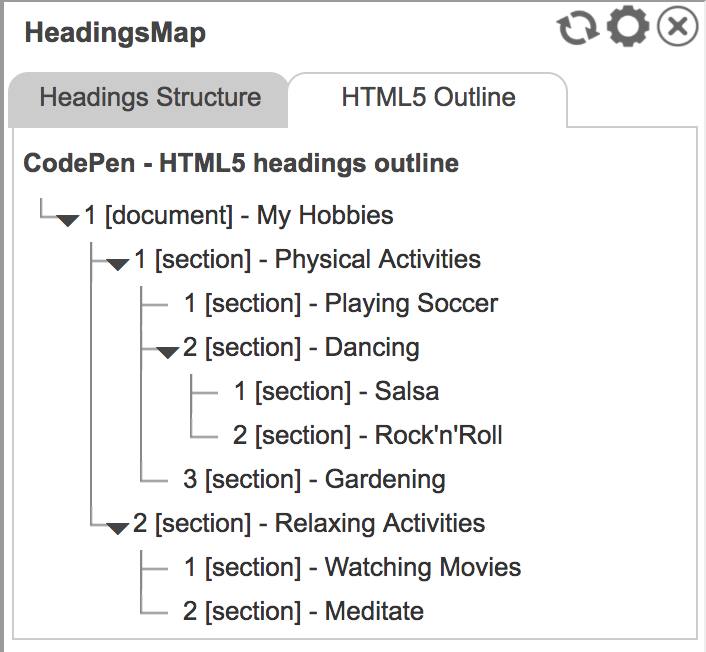 In HTML 5, using structural elements you can start with whatever heading level you want. This makes including external content very easy, as you do not have to worry about the content's heading levels anymore (speaking about it: another way to include external content is by using an iframe, see External Content in iFrames). Sadly though, it is not possible to use HTML 5 heading outlines for accessible websites, as we will explain further on. The HTML 5 outline algorithm sadly was never implemented by any relevant assistive software. Because of that, meanwhile even the W3C advises against using the HTML 5 document outline in its HTML 5.2 draft: Computer says NO to HTML 5 document outline (html5Doctor.com). The following example shows the technically correct usage of the HTML 5 outline algorithm. A film, also called a movie, motion picture, theatrical film, or photoplay, is a series of still images which, when shown on a screen, creates the illusion of moving images due to the phi phenomenon. 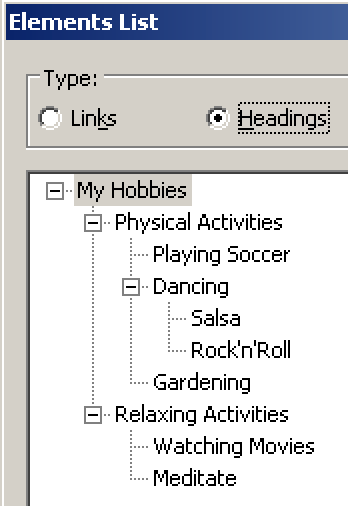 On a visual level, browsers apply stylings that resemble correct indentation of nested heading levels. Checked out with a screen reader though reveal that all headings semantically are on the very first level. What a bummer! If you want to see how the same example ought to be interpreted by assistive software, check out the browser extension HeadingsMap (Chrome) or HeadingsMap (Firefox). It has an experimental feature for displaying HTML 5 outlines. As seen in Alternative techniques for labelling page regions, the HTML 5 structural elements are of great value to accessibility. Sadly though, the HTML 5 outline algorithm - that is made possible by them - cannot be used. But there are alternatives. The best is to simply avoid relying on the HTML 5 outline algorithm. Instead, use the traditional HTML heading mechanism (irrespective of whether you're combining them with elements like <main> or <article>). Backwards compatibility is guaranteed with this solution. But remember: while this is generally working in most modern assistive software, missing backwards compatibility of ARIA can be a real problem for older software. You should only stick to this solution if you really do not have another choice. For more information, see ARIA - when HTML simply is not enough.